This event was a minor idol song event, and one of the the guests was Maru Maru Gakuen Housoubu. The event took place in Akiba Live Studio Rocket Gate, which was a pretty small live house in Akihabara. Actually it was a simple office in a basement turned into a live house. This was located less than five minutes walk from my new office, so I went to watch just the Maru Gaku stage. 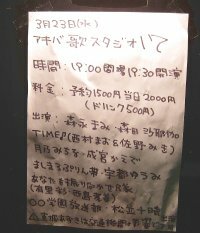 The Maru Gaku stage was supposed to start at around 20:30, and it started almost exactly on time, which is pretty rare for these events. Only seven of the nine Maru Gaku girls appeared. Saori, Kanako, Kana, Nao, Miki, Tomoko, and Haruka were the seven who appeared. The girls wore their black T-shirts and frilly skirts. They only sang two songs and their stage was only around 9 minutes. The songs were "Ginga Senpuu Braiger" and "Mizonokuchi Taiyouzoku". There was going to be a short photo session at the end of the event, but I didn't stay for that. I left right after the Maru Gaku stage.